iconic classic of the great Canadian lodges. One of the largest all-wood buildings in Alberta, it has endured incredible winds and fire to become one of the most recognized lodges in the world. The Prince of Wales Hotel is a charming lodge that we love to spend time at, and we’re confident you will too! 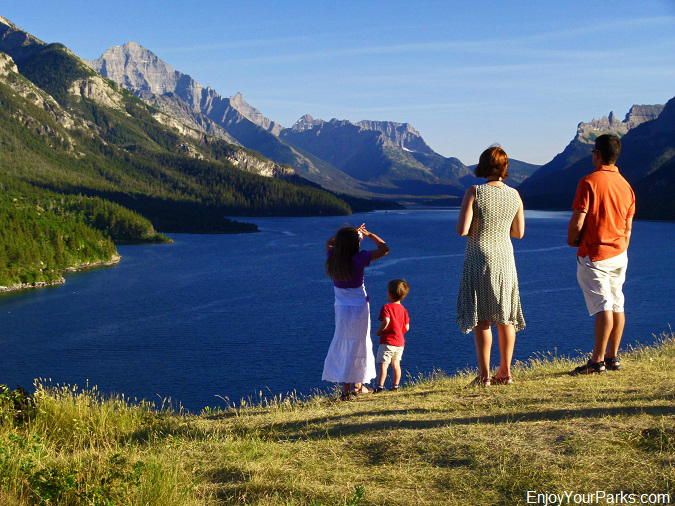 It is without question on the the "top ten things to do" in Waterton Lakes National Park! 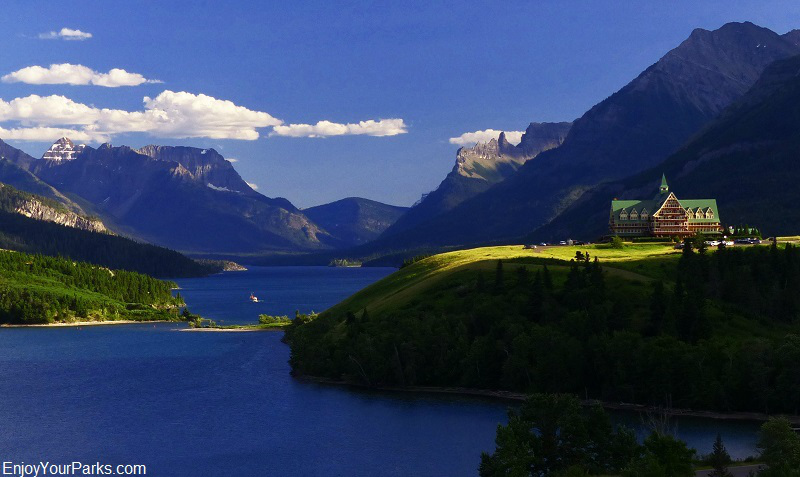 While visiting Waterton Lakes National Park, your vacation would not be complete without visiting this great lodge. The Prince of Wales Hotel is extremely easy to find, because practically no matter where you are standing in Waterton Township, you can see this incredible work of architecture standing tall on a high, barren bluff just to the north of the township. 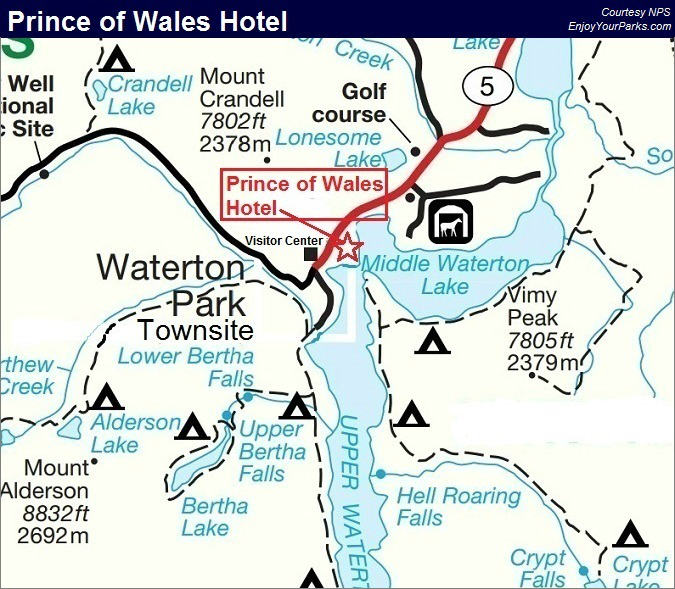 To get to the Prince of Wales Hotel, as you are heading into Waterton Township, the junction is just past the Waterton Lakes National Park Visitor Center. There is a large sign to your left, and that is where to turn to get to the hotel. 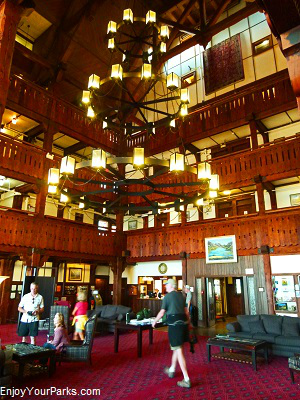 As you walk through its large wooden doors, you will immediately enter the massive lobby. A gigantic chandelier looms overhead as you gaze up at the many levels of floors. But what you will almost immediately notice once you get past the sheer size of the lobby, are the large windows that face Waterton Lake and the magnificent Waterton Valley. The entire south wall is basically all giant windows, and the view is absolutely spectacular. Your view will reach all the way past Goat Haunt Montana and into the great mountains of the Northern Wilderness of Glacier National Park, which includes Mount Cleveland, the tallest mountain in Glacier Park. 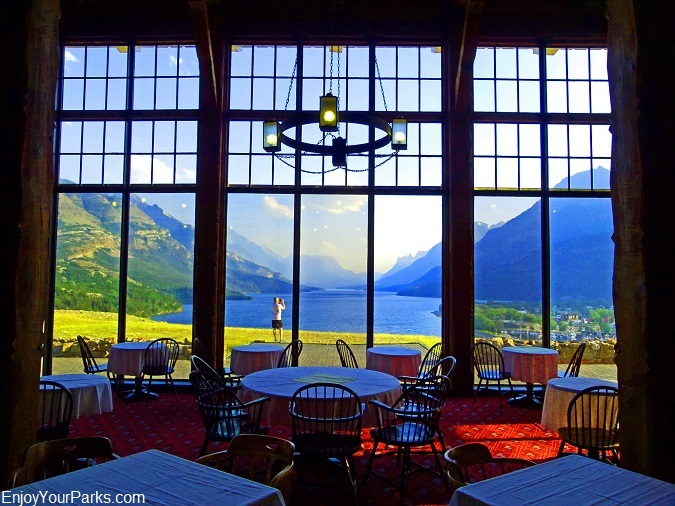 The south wall of the Prince of Wales Hotel lobby is all windows, which give you a spectacular view of Waterton Lake and the Waterton Townsite. Far to the south you will see the mountains of Glacier National Park, including Mount Cleveland. The Prince of Wales Hotel really embraces the “old world charm”, and this gives it a feeling much different than any other lodge we’ve been in. The feeling is a little more “formal and reserved” compared to let’s say the Many Glacier Lodge, which is much more informal and casual. But that’s really the charm of this grand hotel. They even have a formal “tea-time” every afternoon just like in England, which really makes this lodge quite different than its Great Northern Railway counterparts in Glacier National Park. If you’re wondering why there are no trees on the barren bluff that is home to the Prince of Wales Hotel in Waterton Lakes National Park, well the reason is simple… the wind. At times, this bluff is the windiest point in all of Canada, and if you’re ever up there when the wind is really howling, you’ll understand why there’s no trees. In fact, we’ve talked to many visitors who stayed in the hotel during a really windy night and whose rooms were on the fourth floor, and their room actually swayed in the wind!!! 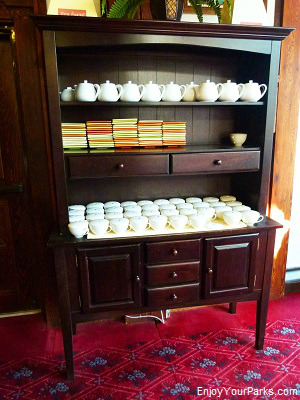 We think this adds even more to the charm of this grand hotel. You gotta love it! When the wind isn't howling, which happens very often during the summer months, we highly recommend that you walk out onto this bluff and take in the incredible view that awaits you. Our favorite time to do this is in the late afternoon or early evening, when the Waterton Valley is lit up by the late afternoon sun,and you'll really see some breathtaking scenery, including the great mountains of the Northern Wilderness of Glacier Park that rises behind Goat Haunt. The mountain that dominates the view to the south is the magnificent Mount Cleveland, which is Glacier National Park's tallest peak. The view from the grounds in front of the Prince of Wales Hotel is spectacular! Prince to hopefully entice him to stay at the hotel during his 1927 tour through Canada, but he instead stayed at a nearby ranch. Oh well, at least they tried! 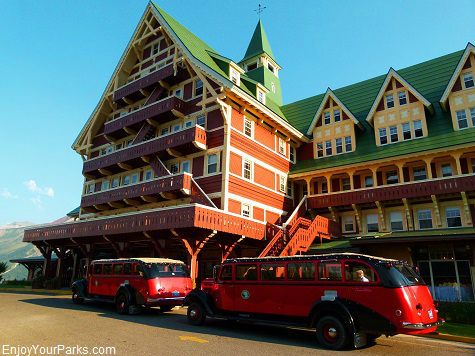 The Red Bus Tours of Glacier National Park actually take visitors up to Waterton to visit the Prince of Wales Hotel and the Waterton Townsite, so it’s a common and welcome sight to see the historic Red Buses parking in front of the hotel. The Prince of Wales Hotel is a National Historic Landmark of Canada, and is an admired sentinel that welcomes all who visit Waterton Lakes National Park. And as we said earlier, a trip to Waterton Lakes National Park would not be complete without visiting one of the most iconic national park lodges in all of Canada. 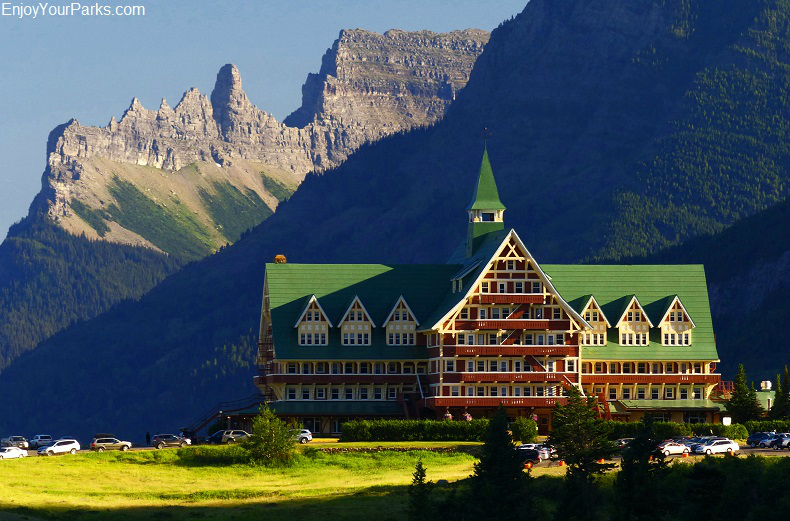 The Prince of Wales Hotel is definitely one of the "Top Ten Things To Do" in Waterton Lakes National Park! 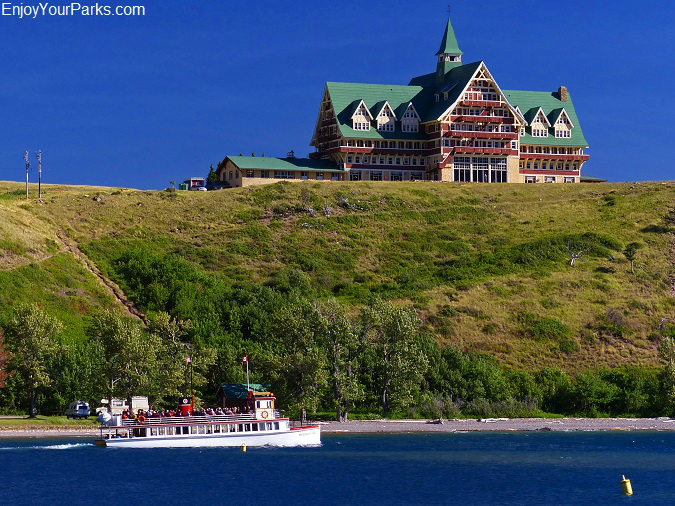 The Prince of Wales Hotel is a "must see" while visiting Waterton Lakes National Park. 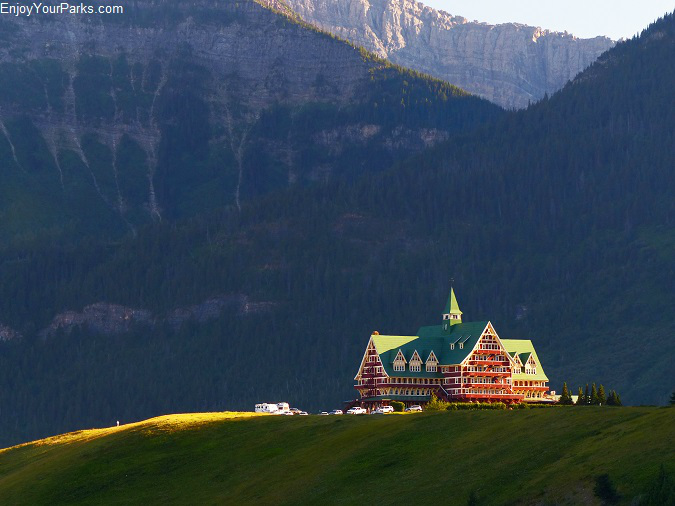 This is the view of the Prince of Wales Hotel from the Waterton Townsite in Waterton Lakes National Park.